Iris, the promotion that brought the Imagine Music Festival to Atlanta in 2013, is planning once again to revolutionize the city's club scene. 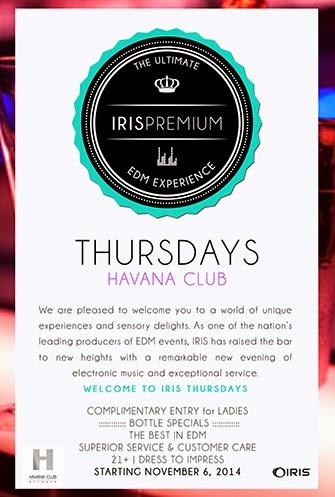 Coming fresh off a "Best of Atlanta" award from Creative Loafing, Iris presents a new 21-and-up experience at the Havana Club called Iris Premium Thursdays. Iris promises the ultimate electronic dance music (EDM) experience with superior bottle service and customer care. It's EDM for the more mature crowd. Iris Premium Thursdays starts 6 November 2014, and ladies get complimentary entry. Guest list spots are still available, but won't last too much longer.